Why did I ever consent to go on this trip? Well, I just won’t think those thoughts. Pam smiled at her friend, nervously adjusting the straps on her life jacket. “That is easy for you to say. You’ve done this before. This is my first.” And I hope, not my last. She thought. They climbed into the rafts, each grasping their paddles and began to make their way down the river. “We should navigate over and between the boulders easily with all the recent rains.” Katie said, loudly. The foaming white water swirling about their raft promised a cold, wet and wild ride. It seemed to pick up speed rushing at them from behind. They were getting closer to the ‘drop-off’ ahead where the rapids cascaded over a ridge of rocks. The settling of boulders fallen from the mountainside during a massive rock slide after the big flood had changed the dynamics of the river. What was easy navigating before now became more challenging and the “Big Drop” as they called it, steeper. The guide had instructed them when to pull up their paddles. Pam’s eyes got as big as the lens on her camera as she now saw what was coming. But, this was like nothing she’d captured before on her camera. Because it was happening to her. “Now! Pull up your paddles.” the guide yelled. Pam’s paddle was caught. She pulled, trying to free it. “Now.” he yelled again. At her. This is a work of fiction. Part 2, the conclusion will be posted in a few days. 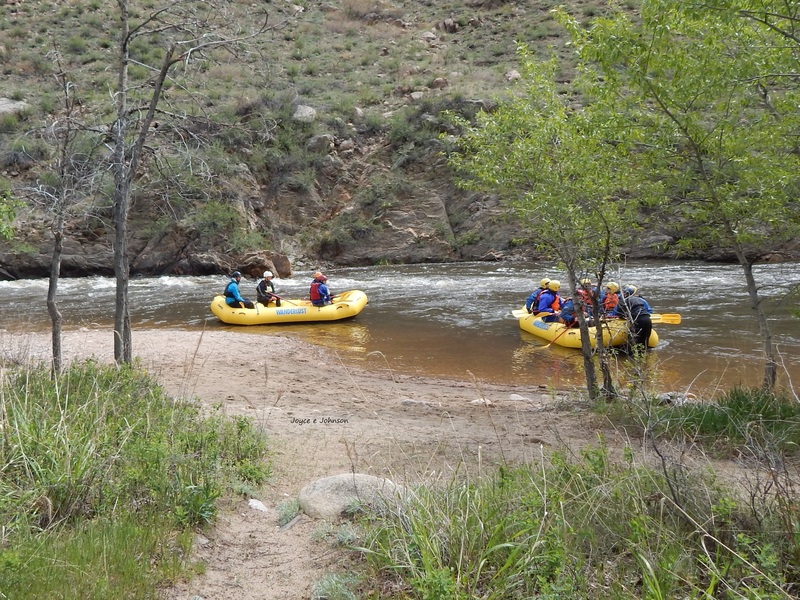 Information on whitewater rafting the Poudre can be found here.